‘But, could you make it yourself?’ was the crux of our discussion as we ate in Tom Dixon’s Coal Office last month. Braised ox cheek with poached egg with hollandaise was the scrumptious brunch offering that I talked up being able to make with the right equipment and ingredients. If you’re competent enough to follow a recipe without bungling it up, there’s little reason why you shouldn’t raise the bar and make something brilliant, my friend argued. Yet, Stem’s seven-course tasting menu reinstated my belief that, while I’m not the worst person I know in the kitchen, I’m far from opening a fine-dining restaurant. 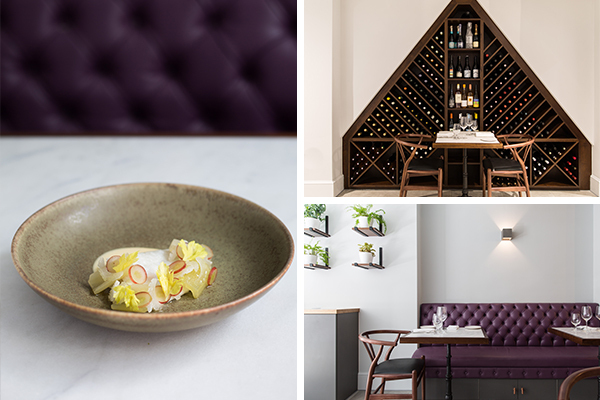 A few minutes from Oxford Circus, you’ll probably have walked past Stem a dozen times, admired its deep green veranda and peered into to slim townhouse to discover that it was a restaurant, a rather bright one. 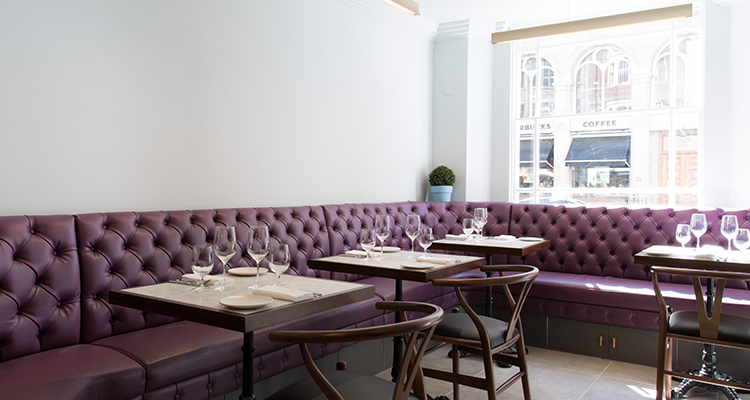 Inside, long aubergine-coloured banquettes line clean, white walls and Moby plays in the background. It’s flattering for photographing food, but less so for cosying up with a date. On the menu is seasonal English fare. 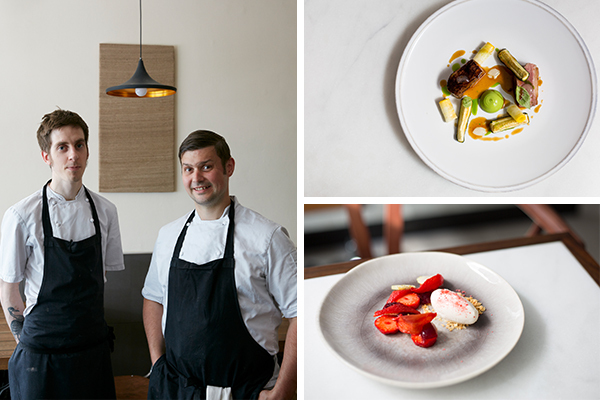 Not dissimilar from chef and patron Mark Jarvis’s other restaurant Anglo in Farringdon, the food is fine and modern. Roast plaice, pork loin, and venison invoke tradition, where celeriac, purple sprouting broccoli and spelt have modern, fashionable connotations. Three courses from the À La Carte menu comes to £38, while the seven-course tasting menu is £60, and half price at lunchtime. The tasting list also covers almost everything on the A La Carte menu. It’d be a rookie error to dive into the bread basket before a tasting menu but crusty sourdough with soft, whipped butter is hard to resist. An amuse-bouche of cheesy choux pastry encased a gooey and sweet mouthful of warm pumpkin. Cubes of cool, sea bream, seasoned with parsley and sprinkled with wasabi had a refreshing kick. A dash of frothy of cauliflower soup, garnished with a slither of cauliflower for added crunch and a sprinkle of chive, oozed creaminess but was super salty. Nonetheless, our sourdough lovingly soaked it right up. Tender goose leg was enriched with sticky blood orange drizzle that clung to its crispy skin. Spelt in a luxurious truffled cream topped with purple broccoli and toasted almonds was a glorious mix of my favourite ingredients. Roast brill, with a skin to crack through, went surprisingly well with grape halves, a lovely sweetener, combined with soft, nutty cep mushrooms (a supplementary dish, but well worth it). The palette cleanser before dessert was an unexpected highlight: crunchy ginger biscuit, cream and fruitiness, three mouthfuls and it was gone. Clementine and white chocolate dessert was a pleasant, luxurious throwback to a tropical Solero. Almost four hours later, we dipped out of a food reverie with a feeling that Stem had held up everything it had to offer, and that we’d tried and praised almost every bit of it. Now, let’s see if I can recreate that roast brill.